Fly La Paz - Rurrenabaque. Drive to the Beni savannas. Beni savannas - Rurrenabaque - Madidi National Park. San Miguel - Chalalan lodge. Chalalan - Rurrenabaque - Fly to La Paz. Madidi national park and beni lowlands. Expect: 350-400 species, good accommodation in wildlife lodges, easy to moderate terrain, mild to hot climate. Departures anytime from April to October. The Madidi National Park is home to some of the greatest riches of Bolivia and is also one of the world’s priorities for conservation as it is one of the most extraordinary reservoirs of genetic material on the planet. The park is characterized by its exceptional wealth of biological riches and a variety of ecosystems. Madidi is home to over 4,739 species of plants, 1,370 species of vertebrates and 867 tropical birds and endemic plants, making it a priority for conservation. East of Madidi National Park are the floodplains of Beni department. Locally known as “Pampas” (flatlands), this place consist of humid savannas, palm groves and woodlands home to an amazing variety of wildlife. 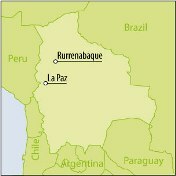 Our tour starts with a short flight from the city of La Paz down to the village of Rurrenabaque, located by the river Beni. As we fly towards the lowlands you will enjoy stunning views of snow-capped mountains, valleys and canyons covered with lush cloud forest and finally the Amazon basin. Once in Rurrenabaque, we’ll take a 4x4 vehicle to drive east into the Beni savannas towards the Tororal ecolodge. We’ll be making stops on the way to look for Greater Rheas, Jabiru, Wood and Maguari Storks, Anhingas, herons, spoonbills and other wildlife, such as river dolphins, sloths and Caimans. Our stay in the area will allow us to walk on trails through forest, open habitats, and take canoe rides to look for numerous birds. Returning to Rurrenabaque, we’ll board a motorized canoe to navigate the river Beni through the Bala canyon, towards Madidi national park. On the journey to Chalalan ecolodge we’ll look for Orinoco geese, Pied Lapwings, Black Skimmers and maybe some macaws overflying the river. The lodge is located deep in the heart of the national park, surrounded by tall Amazon forest. Days will be spent walking on numerous trails and canoeing on the beautiful Chalalan lagoon. The trip ends as we fly back to La Paz, from where you can take another tour to explore the Puna Altiplano and the Yungas Cloudforest. Please fill the form below to receive more information.